Yonge Street is the central spine of North York Centre, one of four mixed-use and transit accessible centres in Toronto that are identified in the Official Plan (see the Secondary Plan map showing North York Centre). Jobs, housing, and services will continue to be concentrated here. Meanwhile, the street is badly in need of reconstruction. City staff have been in consultation with the community to develop a new design for the corridor as a destination: a street that puts people first. Yonge was identified as a key piece of the city-wide cycling network in the 10 Year Cycling Network Plan, which was approved by City Council in June 2016. Safe infrastructure for cyclists on Yonge Street is also part of Toronto’s Vision Zero Road Safety Plan. Unfortunately, while the population in this area continues to grow rapidly, Yonge Street in North York remains an unwelcoming place to ride a bike, with well documented safety deficiencies. 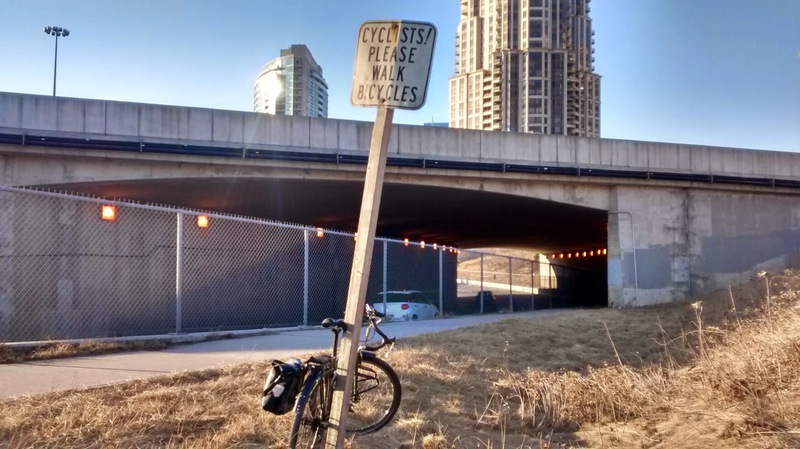 Widened sidewalks and cycle tracks would help the street transform as a destination, and would connect to the Yonge-University Subway and to the Finch Hydro Corridor which is a commuter/recreational trail that crosses North York and beyond. REimagining Yonge Street is good for business, too. A beautified and enhanced public realm would encourage more people to spend more time along this stretch of Yonge Street, and the enhanced safety elements would make it an attractive destination for people of all ages and abilities. Transform Yonge would dramatically improve the pedestrian environment by widening sidewalks and adding benches, trees, and flowers. Currently, sidewalks along Yonge are crumbling and too narrow to handle a quickly growing population. Two words: bike lanes! Transform Yonge is the only option that includes protected bike lanes on Yonge - North York's central corridor. Bike lanes would connect to the well-used Finch Hydro Corridor, contributing to a true network in North York. It's better for business. We learned from Bloor Street that total customer spending in the pilot area increased more than outside the pilot area after installation, suggesting that bike lanes are good for business. It makes sense financially. The alternate option, Enhance Yonge and Transform Beecroft (a collector road running parallel to Yonge), would add $20 million to the pricetag and represent a huge missed opportunity to rebuild North York's central corridor, making it safer and more attractive for all road users. Residents overwhelmingly support the project. During the City's public drop-in events and meetings with homeowner associations and condo boards, a majority of residents indicated they'd prefer to live near a four-lane main street - as opposed to a six-lane highway. Can you blame them? ​Transit is at capacity, and plans for a relief subway line are years away. The lack of dedicated bike infrastructure on Yonge Street is an impediment that creates conflict and danger for all road users. As a result, people who would otherwise choose a bike to cover short distances end up driving through heavy traffic, taking overcrowded transit or walking on congested sidewalks. Our vision is for a continuous, safe bikeway along Yonge Street, from Lake Ontario in the south to York Region in the north. Yonge Street connects numerous employment and shopping hubs, including the Financial District, Dundas Square, Yonge & Bloor, Midtown, Eglinton, Lawrence, York Mills, Yonge & Sheppard, North York Centre, and more. It connects two major universities, the North York Civic Centre, vibrant shopping areas like the Eaton Centre, Yonge-Eglinton Centre and Centrepoint Malls, as well as many schools, libraries and community centres. Yonge Street is well served by its own subway line - the busiest transit line in Canada. With all this, Yonge Street is a magnet for residential growth, with several new condo buildings and apartments popping up every year. Toronto is growing, and Yonge Street will experience unprecedented growth as a result. Local businesses would only stand to benefit from the increased number of pedestrians and cyclists bike lanes would bring to their doors. We must act now and design Yonge Street so that it is safe, accessible, and allows road users to move predictably and efficiently along the corridor. Failing to do so will endanger the lives of our most vulnerable road users: cyclists and pedestrians. As a cross-city connector, protected bike lanes on Yonge St will connect communities, grow business, bring more vibrancy and life to the existing Yonge St corridor and be a backbone of Toronto's Minimum Grid. These bike lanes can get people moving safely and effectively across Toronto. Studies for protected bike lanes on Yonge St from the Waterfront to Bloor St and from Highway 401 to Steeles Ave are already underway and we believe those lanes should be built as soon as possible. We also believe studies for protected bike lanes between Bloor and the 401 should be launched as soon as possible.